this is my first recipe for an asian dish (here i mean non-japanese/chinese dishes). it is called “gai pad gra pow (grapow for short),” which is a dish with stir-fried minced chicken with basil leaves, served with freshly cooked rice. i believe the dish is from thailand, as i always come across it in various thai restaurants. my mother never cooked asian dishes at home, hence no asian recipes have been passed on to me. i always avoided making any of them so that I wouldn’t fail, and quite frankly, i had no idea how to make them. but when i was grocery shopping the other day, i remembered that i had some leftover basil leaves in my fridge that i badly wanted to avoid wasting. as i had cooked an italian dish with the basil leaves a few days before, i decided to break the ice and try to make my first asian dish. with my instinct to replicate the memory of its taste and with just one special ingredient, i made a miracle. the magical ingredient is called “nam pla,” which is thai fish sauce. you can buy it at any asian food store. i usually buy a small bottle (100ml or so), as i don’t use it so often obviously, and i like to use it fresh as much as possible. 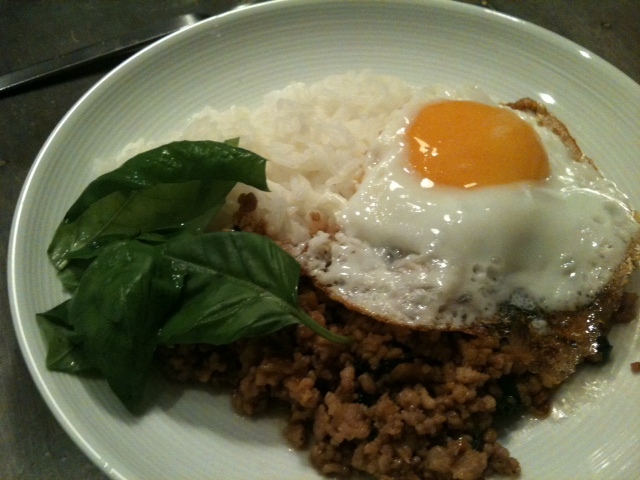 here is my recipe of the grapow rice, with a hint of japanese essence. 9. serve it with freshly cooked rice and a sunny side on top (the sweetness of the egg york suits the spicy/salty grapow extremely well!). put the fresh basil leaves on the side as well!